The first POF were manufactured by DuPont as early as the late sixties. Due to the incomplete purification of the source materials used, attenuation was still in the vicinity of 1,000 dB/km. During the seventies it became possible to reduce losses nearly to the theoretical limit of approximately 125 dB/km at a wavelength of 650 nm. At that point in time glass fibers with losses significantly below 1 dB/km at 1,300 nm/1,550 nm were already available in large quantities and at low prices. Digital transmission systems with a high bit rate were then almost exclusively used in telecommunications for long-range transmissions. The field of local computer networks was dominated by copper cables (either twisted-pair or coaxial) that were completely satisfactory for the typical data rates of up to 10 Mbit/s commonly used then. 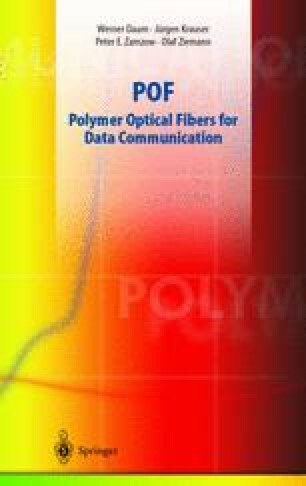 There was hardly any demand for an optical medium for high data rates and small distances so that the development of the polymer optical fiber was slowed down for many years. A significant indicator for this is the fact that at the beginning of the nineties the company Höchst stopped manufacturing polymer fibers altogether.